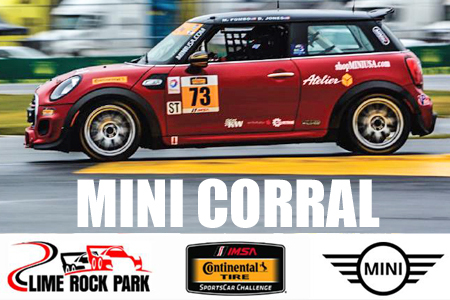 MINI USA will be the host for the MINI Car Corral at Lime Rock Park. The event includes exclusive parking, snacks, beverages, and a meet and greet with the team. Parade lap days and times t.b.a. Coffee, juice and pastries to be served in the hospitality tent at 7 a.m.
Meet and Greet the team at 7:30AM in the team paddock. Food and beverages are compliments of MINI USA. The car corral does not include track admission and costs $20 per day. You have to purchase your tickets separately. The race at Lime Rock Park takes place on July 23rd at 10:00 AM EST.